Field grown nursery stock ready for bare root supply. January is slap bang in the middle of the busiest planting season, the bare root planting season, this is from mid- November to mid to end of March and down in the warmer climbs of the South East of England, 1st December to the end of February would be my cut off point. Before the modern practise of being able to grow plant stock in containers so it could be planted all year round, this was the only time of year when planting could be carried out successfully. planting a bare root tree. There is a lot to be said for still using bare root and and root balled stock. In my mind trees and hedges, establish much better, as the plants are being planted in the dormant season, They have an opportunely to get their roots well and truly saturated, and root growth and establishment can begin late winter and early spring, meaning that by the time the planting gets to June it has had the best possible nurtured start. The plant will cope better with it’s first Summer growing season, no matter what is throw at it, particularly if a prolonged hot summer like 2018, is in store. Also you get a lot more plant for you money so planting bare root and root balled is cheaper. Traditionally, deciduous plants were bare root and evergreens root balled although often larger deciduous trees these days are root balled. 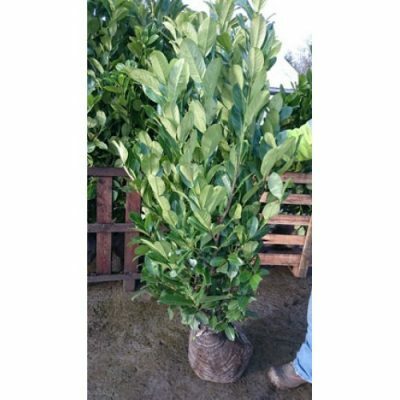 So all trees, hedging, including evergreen can be planted as bare root or root balled. Also roses do very well planted bare root and traditional fruit nurseries supply must of their stock through the bare root season, with fruit trees and soft bush fruit supplied bare root, or for some of the larger trees and fan trained specimens possible root balled. 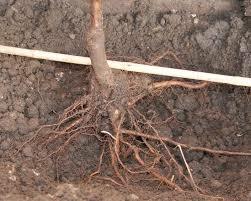 Also quite a few of the smaller more specialist nurseries still supply bare root herbaceous, which can establish well. They traditionally used to arrive packed in damp news paper, sadly plastic segmented packaging has taken over but perhaps with plastic now rearing it’s ugly head the nursery industry is starting to really put its house in order and news paper may make a come back, only time will tell. 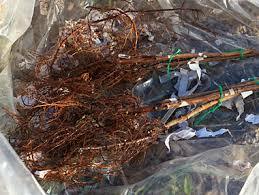 My top tips for planting Bare root stock. when the stock arrives, if you can’t plant it straight away then heal it in so the roots are protected from the weather, ready for planting. Soke stock for a couple of hours before planting, or over night so the roots can rehydrate. Prepare the ground, if you are planting into uncultivated ground than dig a hole about twice the depth of the root ball forking over and breaking up the ground at the bottom of the hole, the hole should be twice the width of the root ball. Fill the hole back with broken up soil and good organic material well rotted F.Y.M or horse manure is very good, it wants bulk if possible. So the hole is now 1.5 times the depth of the root ball. Put the tree in the hole and use a garden cane across the top to check the depth of the hole, the tree should go back at the same planting level as it was planted before, the tenancy is often to plant too deep. Stake, if 1 stack it should be on the prevailing wind side whether upright or angled stacking. Or for larger trees or very exposed sites 2 stacked and a cross beam. Remember to always ties the tree to the stack, allow extra length in the tree ties so it can be let out as the tree grows. 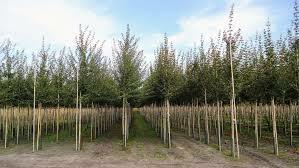 Most trees will only need staking for the first 3 years of their life. Depending on the variety of tree and jow exposed the site is. Back fill with the soil and manure mix, firming in well. Label you tree, planted by who and when and variety. 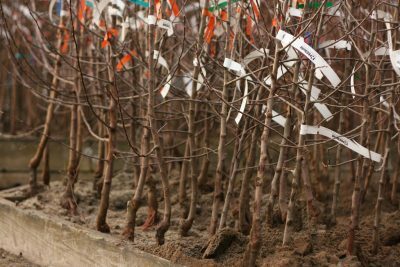 So there are still a few months of the bare root planting season left, enough time to get those planting orders in quickly over the New Year and get planting before the end of February. Be warned stock gets thinner on the ground as the season begins to draw to a close, so don’t delay. Happy Planting. If you would like help with the re-design of a planting area or the design of a new fruit orchard, then I know just the woman who can help. Please do give me, Emily a ring Tel:01273 470753, or get in contact through the contacts section of the web site. 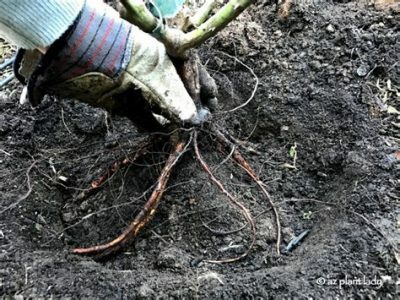 This entry was posted in Gardening Thoughts, Gardening Tips and tagged bare root and root balled on January 2, 2019 by Emily.